Newlyweds, a dog, outdoor adventure and the open road—what more could you need? Most people hear the term “honeymoon” and immediately think of newlyweds lounging on an island somewhere with tropical drinks. While many people would happily take that vacation and enjoy every minute of it, there are others who would much rather opt for a trip that’s more active. Such was the case for newly-married couple Heather and Will—and their dog Tally. The adventurous couple, who met on an outdoor press trip, wanted to spend their honeymoon doing the things they love most and they didn’t want to leave Tally behind, so they planned the adventurous road trip of their dreams. 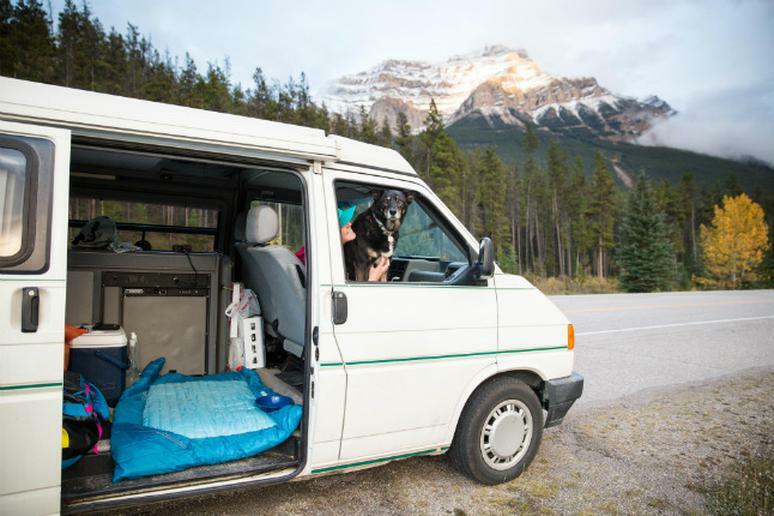 Living out of an old school outfitted Volkswagen van; they’re chasing fall foliage along the Rockies into Canada and visiting some incredible preserved land along the way. Heather, Will and Tally are mountain biking, trail running and climbing their way through some of the most beautiful parts of the Rockies, in what many would call a less-than-traditional honeymoon. The tentative plan for their two-week trip, includes Lewis & Clark National Forest, Banff and Lake Louise area, Ice field Parkway, Jasper National Park and Flat Head National Forest. But plans could easily change if they find the fall foliage is better somewhere else. That flexibility is easier when you’re living out of a mid-90s EuroVan that’s been converted into a camper. The rented van is outfitted with a bench that converts to a full-sized bed, a sink, heater, propane two-burner stove and a pop top that allows you to stand upright when you're parked at camp. They added a few things for Tally’s comfort and they sleep in it every night, except for the one night they spent in a pet-friendly hotel. This trip, Heather said, is proof that you can bring your dog with you. So many people think they have to leave their dogs home, but that doesn’t have to be the case. “We had already talked about planning a honeymoon where we could bring Tally, and when we found out that Canada's National Parks allow dogs, we started formulating a plan to get Tally on her first international adventure (and her first National Park),” Heather said. “Last spring, Kurgo provided applications for scholarships to support dogs and their owners going on adventurous trips together.” Tally won the scholarship and trip plans started to take shape. All photos courtesy of Will Rochfort—see more of his photography on his Instagram.